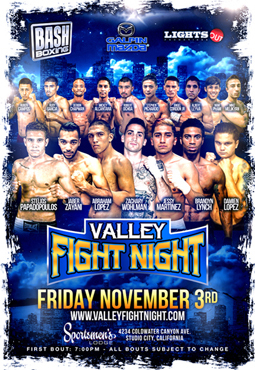 The ONLY regular professional boxing show in the 818 returns to the World Famous Sportsmen's Lodge Events Center in Studio City, Californiaon Friday, November 3, 2017 as our newest sponsor, GALPIN MAZDA, presents another installment of VALLEY FIGHT NIGHT. 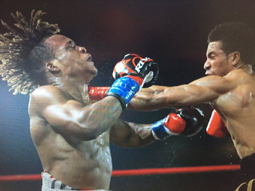 Some of the best young boxing prospects in Southern California will once again be on display as Bash Boxing, Lights Out Promotions, andPR Sports have scheduled 10 professional boxing bouts featuring several boxers from the San Fernando Valley. 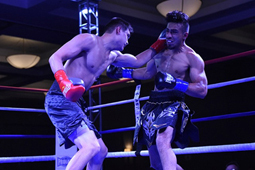 The red hot trend of BOXERS vs. MMA FIGHTERS will be in full effect as FOUR bouts will feature MMA fighters vs. Boxers in the Valley Fight Night ring. First, Tarzana's undefeated Jessy "El Mago" Martinez (7-0 Boxing) will take on former UFC, Bellator, and Strikeforce veteran Nam Phan (21-17 MMA, 3-4-1 Boxing) in a 6 round Super Welterweight bout. Phan is well known in MMAcircles through his appearances on the The Ultimate Fighter and garnering multiple Fight of The Night accolades in the UFC. Phan has also challenged for the Strikeforce Lightweight World Title challenger versus Josh Thompsonand captured the King of Pancrase Featherweight Champioinship in Japan. Martinez has risen up the boxing ranks with two spectacular stoppages in 2017 and looks to close out the year with another victory against his toughest foe to date. Then, Burbank's Damien Lopez (3-0-1 Boxing)will take on local MMA favorite in Reseda's Derion "The Thriller" Chapman (4-7-1 MMA, 1-0 Boxing) over 4 rounds. Lopez has shown a penchant for thrilling bouts in his young boxing career with an all-action style. 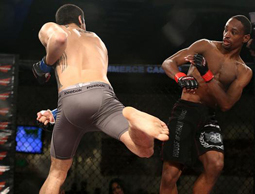 Southpaw Chapman went undefeated as an MMA amateur with a 3-0 record and has been a fixture on the CXF MMA shows at Sportsmen's Lodge. Chapman made an impressive debut in the ring by knocking down and then winning a unanimous decision against Kevin Vasquez last June. 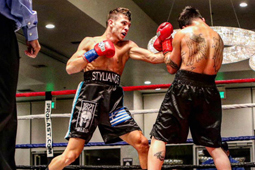 Also, The Valley's own Brandyn Lynch (2-1 Boxing) returns to Sportsmen's Lodge where he has already knocked out MMA fighter Christian Camp to face yet another Pro MMA fighter turned boxer in popular import Jordan Marriott (5-9 MMA, 1-3-2 Boxing) in a four round Middleweight bout. Marriott entertained the Studio City faithful during the last Valley Fight Night with a hard fought draw against undefeated Travis Gambardlla (2-0-2) last August and took local favorite Bryan Flores (6-1) to the limit in a close majority decision loss in June. Finally, Gardena's Stephen Pichardo (1-1 Boxing) will face off against MMA's Donnis Reed (5-4 MMA, 0-1 Boxing) in a four round Middleweight. 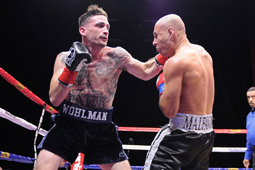 Also featured on the November 3rd Valley Fight Night card will be San Fernando Valley fixture Zachary Wohlman (10-2-2) taking on Moris Rodriguez (6-10-1) in a six round Welterweight bout. Wohlman is the focus of the critically acclaimed Why We Fight show on Verizon's go90 network and executive produced by Ronda Rousey. Rodriguez is no stranger to upsets, posting wins against previously undefeated boxers David Lopez (4-0) and Jonathan Chicas (8-0), and Bret de la Torre (2-0). Wildard Boxing Club's Light Welterweight undefeated import from Greece Stelios Papadopoulos (8-0-1) takes on Martin Angel Martiniez (17-12). South El Monte's Miguel Alcantara (3-0) takes on Adrian Rodriguez (2-9-1) over four rounds at Super Bantamweight. 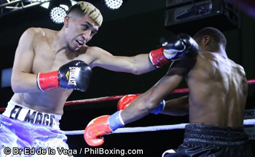 Glendale's Alexander Enriquez (3-0-3) battles Victor Torres (2-6-1) in a four round bout at Super Bantamweight. Duarte's Albert Leyva (0-0) makes his Super Middleweight professional debut against North Hollywood's Francisco Alfaro (0-1) in a four round bout. L.A's undefeated Bantamweight prospect Rudy Garcia (5-0) faces fellow Los Angeleno Yezber Romero (2-5) over 4 rounds. Doors Open at 6:30pm; First Bout at 7:00pm SHARP. All bouts are subject to change.